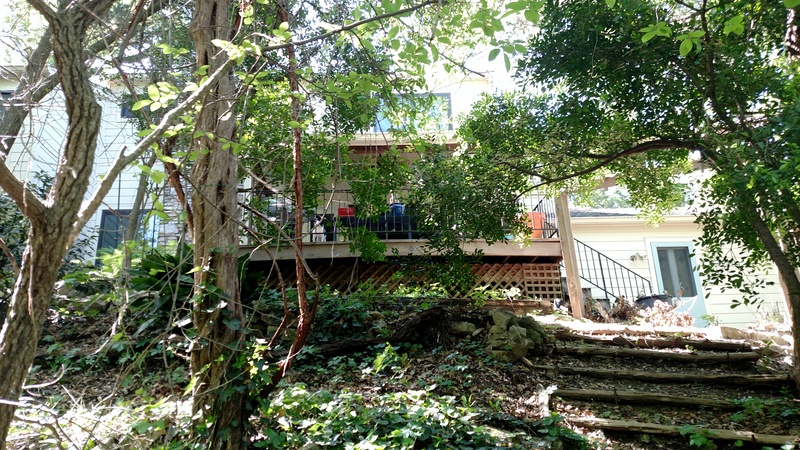 What could be better than a big, beautiful flagstone patio just outside your back door? 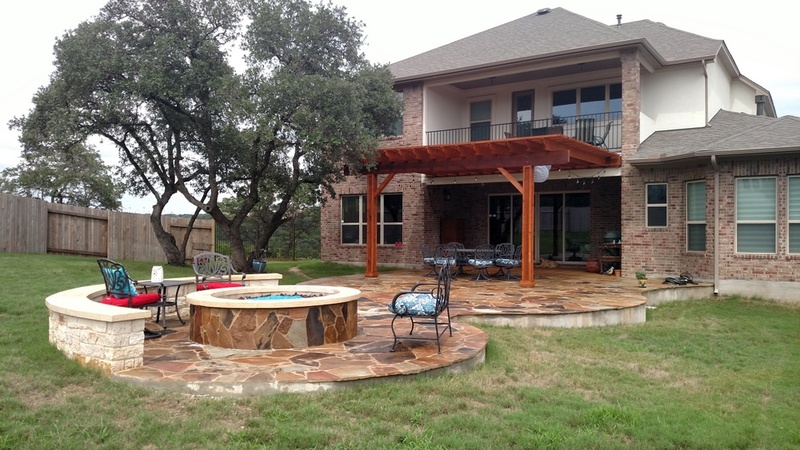 How about a double flagstone patio with a grand cedar pergola for shade at one end and a stone fire pit for warmth and ambiance at the other end? 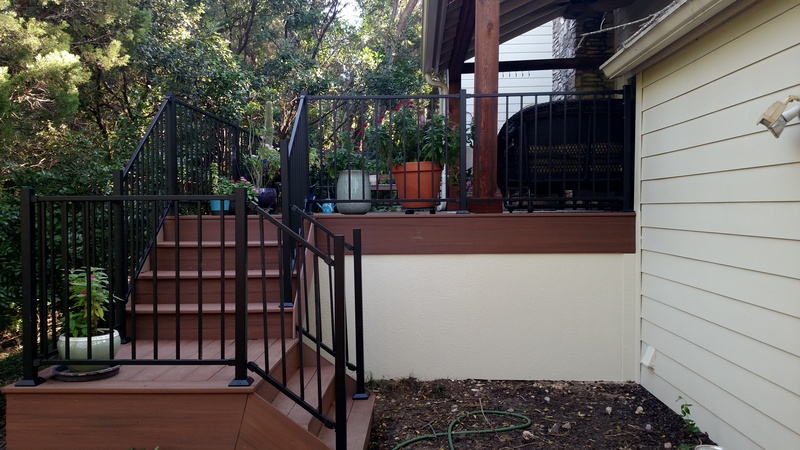 Archadeck of Austin recently completed such a combination outdoor living addition in Cedar Park, Texas, and the homeowner can’t wait to show it off. The first two things you notice here are the spacious patio, with its unique curvy shape, and the beauty of the multi-blend Oklahoma flagstone. 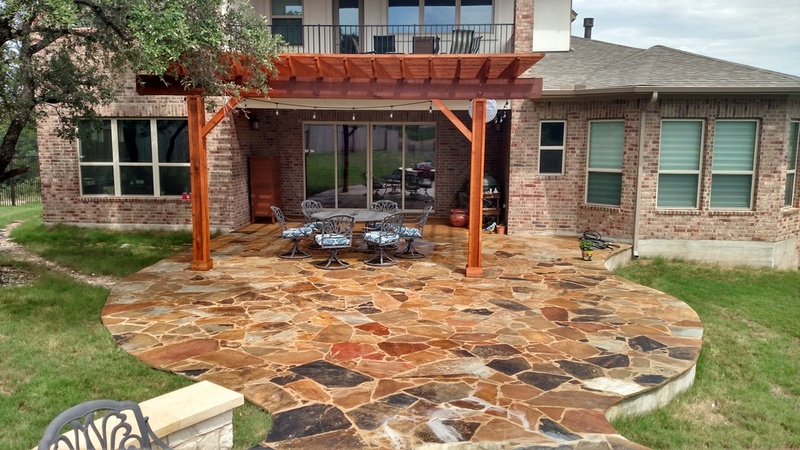 Equally as impressive is the rustic cedar pergola, and this pairing of natural flagstone and cedar is stunning. 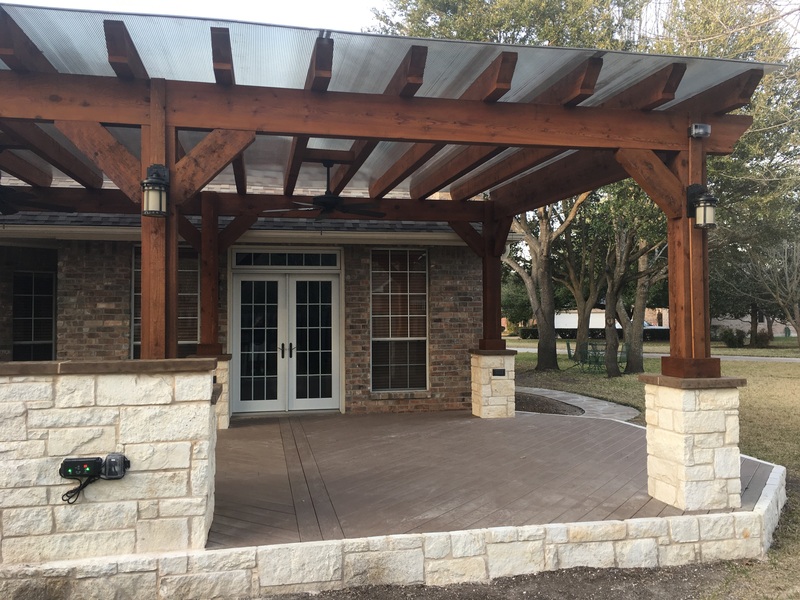 In character with its Texas setting, this pergola is stronger and “beefier” than some because it features big, 6″ x 6″ posts, exceeding the normal standards for pergola construction. 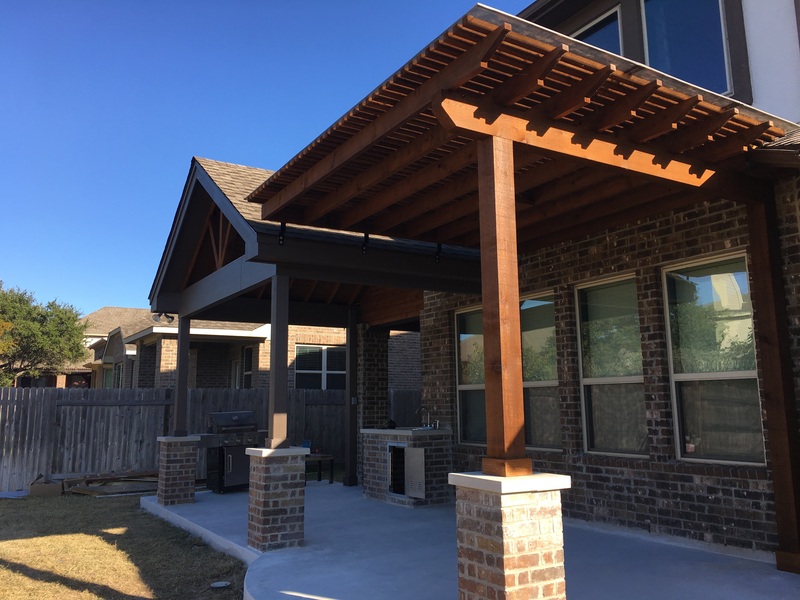 Since shade is so valuable on sunny Texas days, we designed the pergola with 2″ x 2″ slats across the top spaced every 3″ apart to enhance the structure’s shade benefits. 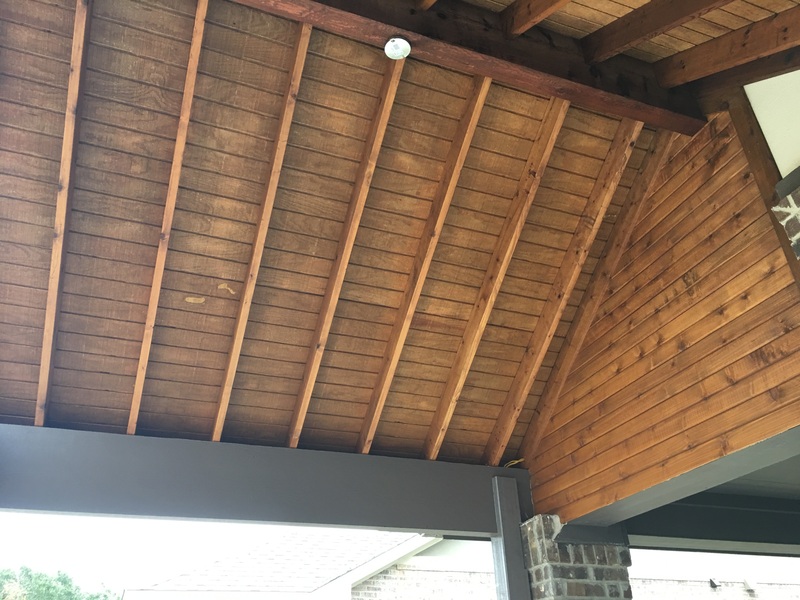 Strings of party lights hanging from the pergola’s rafters turn this section of the patio into the ideal spot for outdoor dining any time, day or night. 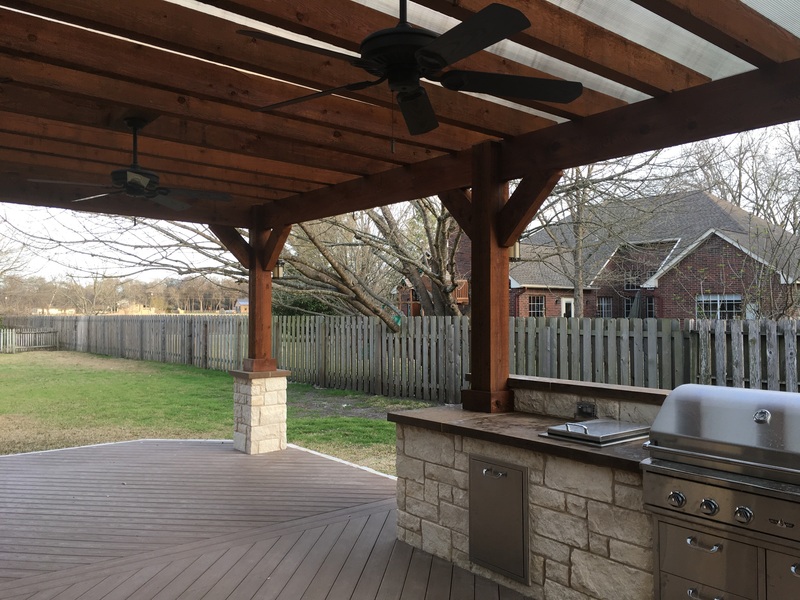 On cooler evenings, the family will be drawn to the opposite end of the large patio where a matching stone fire pit will provide warmth as well as cozy ambiance. 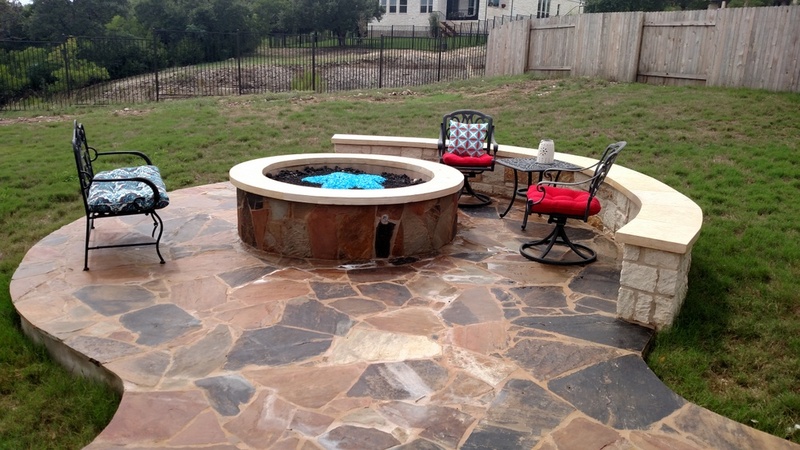 This is a gas-burning fire pit with a 36″ burner that heats rock and blue glass stones. The result is a highly effective and beautiful fire pit with stones that glow with firelight and put off a lot of heat. 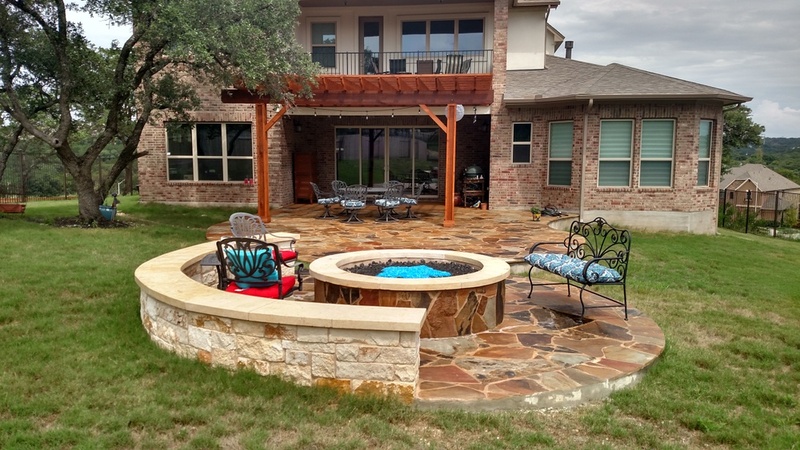 Don’t you love the custom-designed Texas star pattern of the blue glass stones in the fire pit? 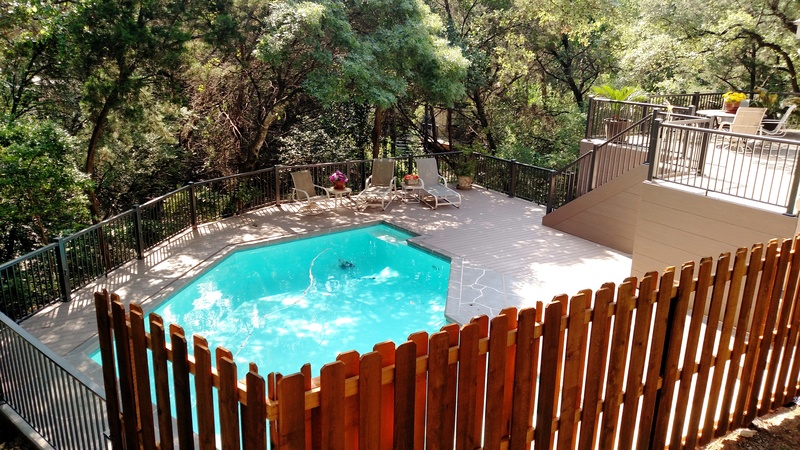 Family and friends will naturally gather around the fire pit to share stories, sing campfire songs or just get lost in the hypnotic glow of the flames. 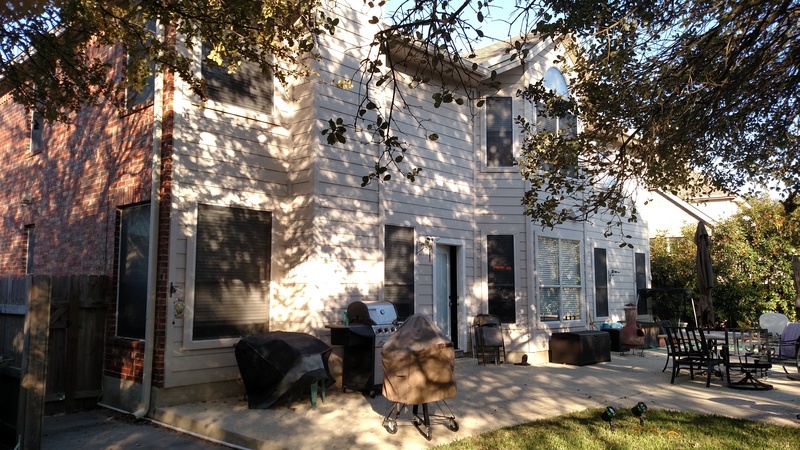 This Texas-size patio is large enough that quite a few people can gather by the fire for warmth and camaraderie. 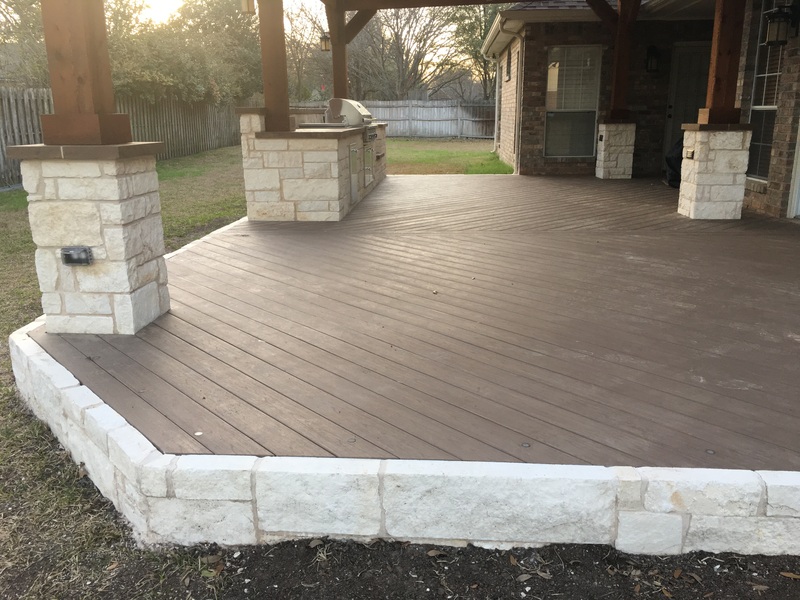 The homeowner chose to add a seating wall on one side of the fire pit while leaving the other side open for patio furniture that can be rearranged depending on the need. 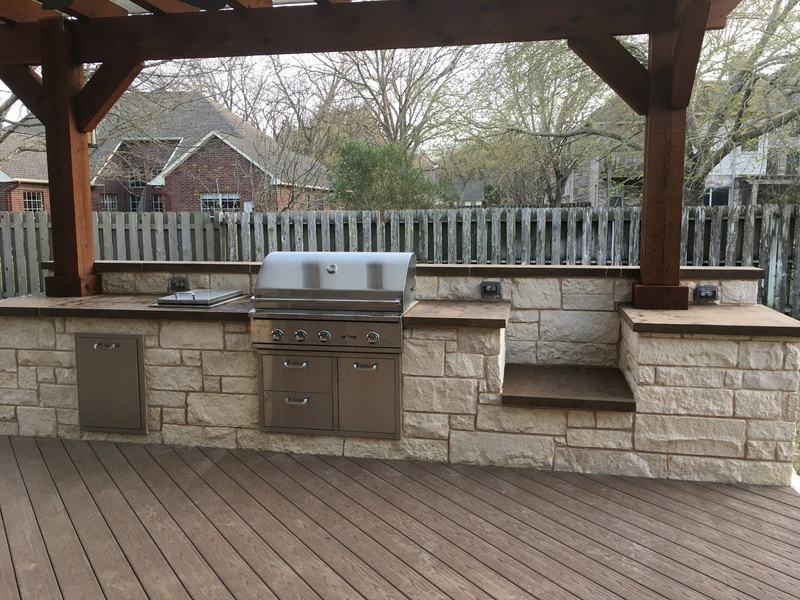 The seating wall was built with natural limestone that complements the flagstone patio but doesn’t compete with it for attention. 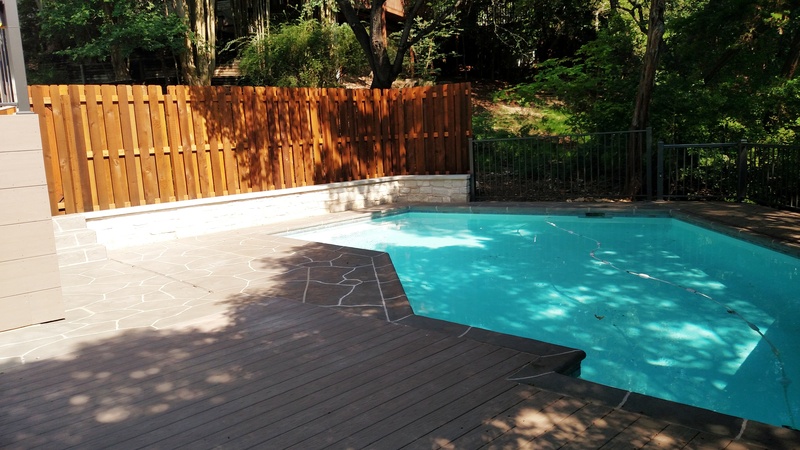 This patio floor is built to exceed the standards for patio builders in the Austin area. 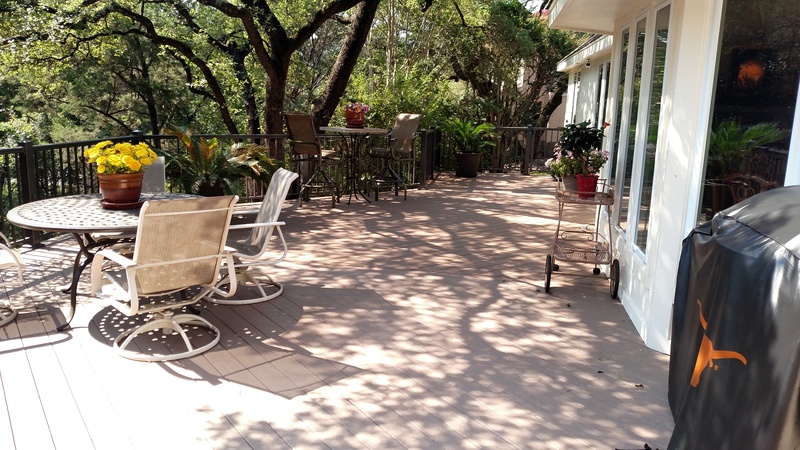 Most builders only use a layer of decomposed granite with grout mixed in as the base for their patios. 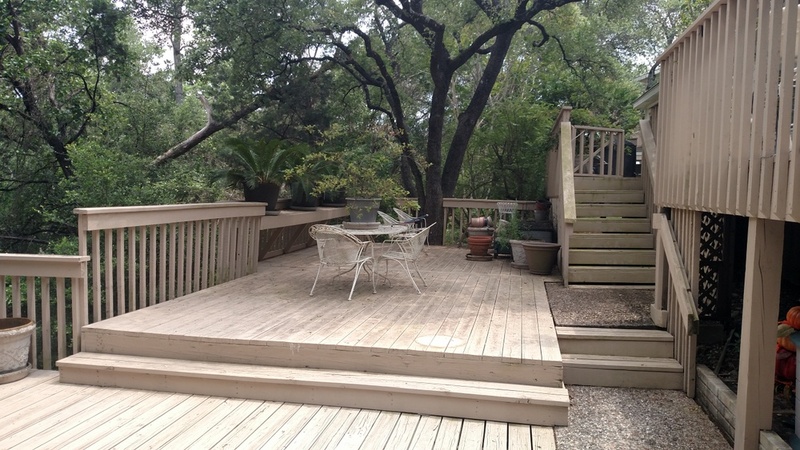 Archadeck of Austin actually poured a solid, full-scale concrete patio to use as the patio’s base. 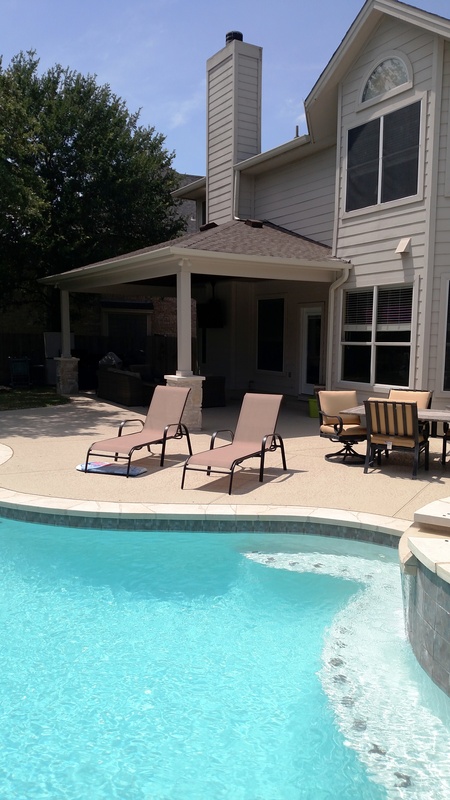 This is because, over time, this patio will not sink, tile chip or joints crack with this method. 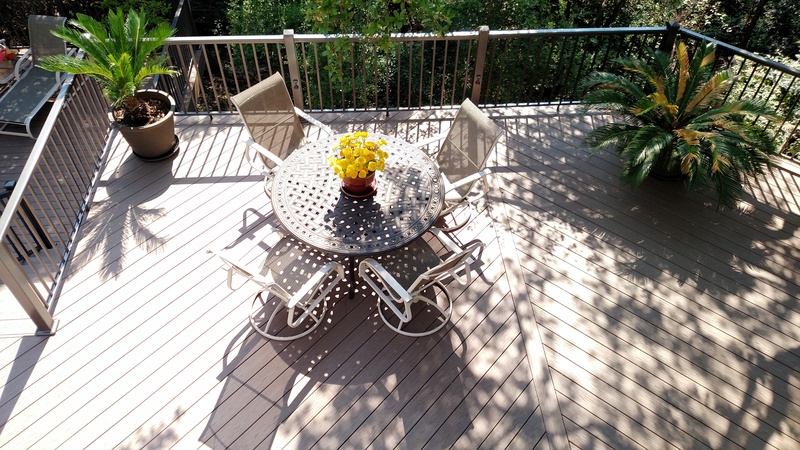 This gives the patio a longer life with no chance of incurring structural issues due to weather conditions or time. 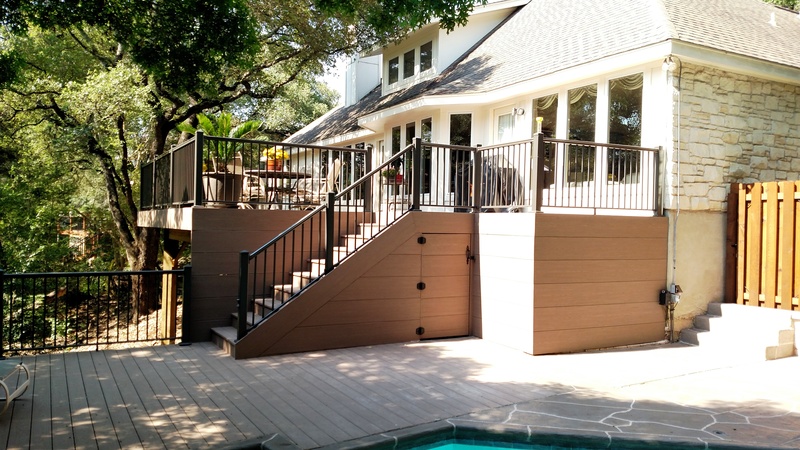 Archadeck of Austin started this gorgeous project with a “blank slate” because, before we built this addition, the rear of the house simply opened into the backyard. 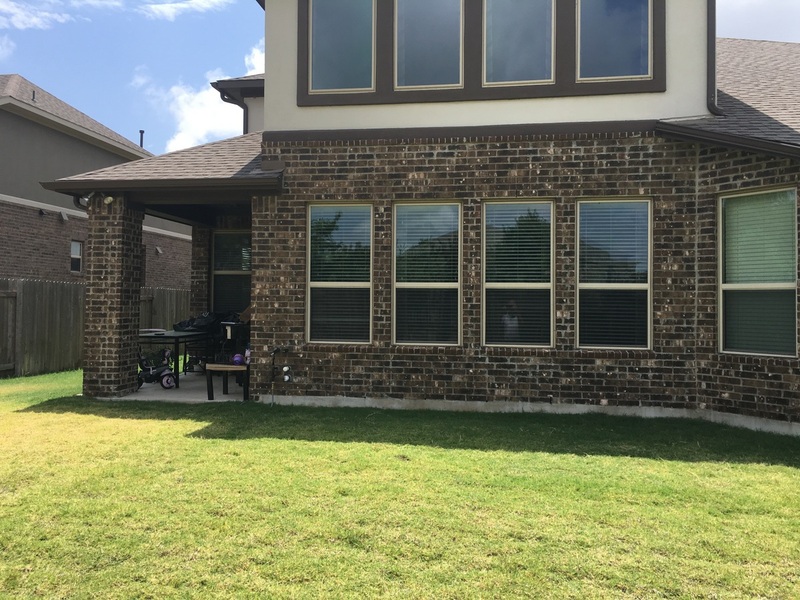 The finished patio makes great use of an area that was once void, so this project can serve as inspiration for anyone presently lacking an outdoor living space! 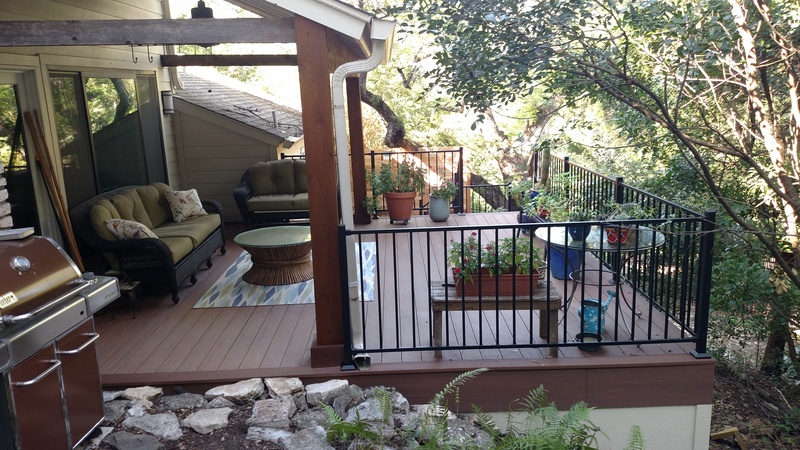 If you would like to learn more about creating such an inviting outdoor living space right outside your back door, contact Archadeck of Austin today at (512) 259-8282 or via email at jim.odom@archadeck.net. 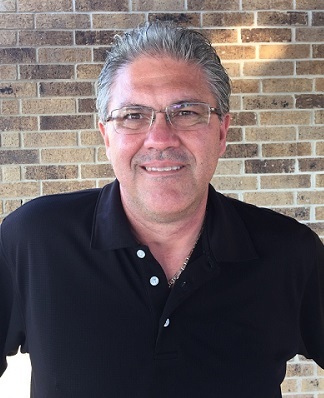 I think, often times, when a client looks to us to improve their outdoor living space or establish a new one, the assumption is the project has to be large in order to be effective. This is certainly not the case. A good outdoor living space design should not only speak to the scale of your existing home and landscape, it should also speak to the function you wish to carry out within the space as well as your budget. 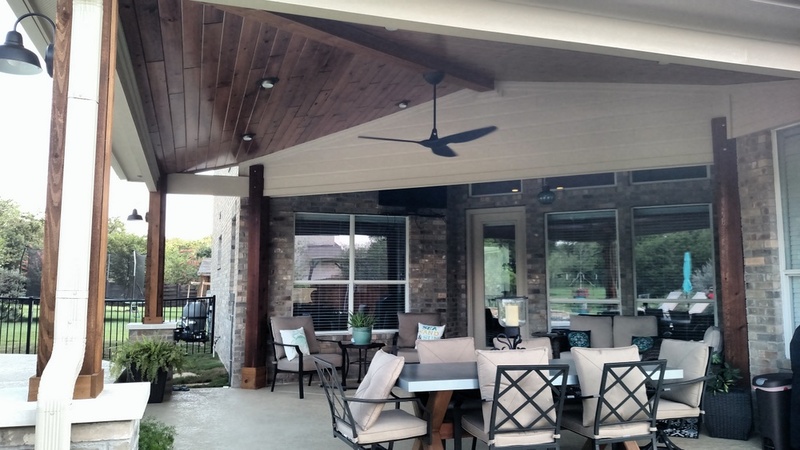 Here at Archadeck of Austin our goal is to provide you with the most value through an outdoor living space that is customized to fit your specific needs. 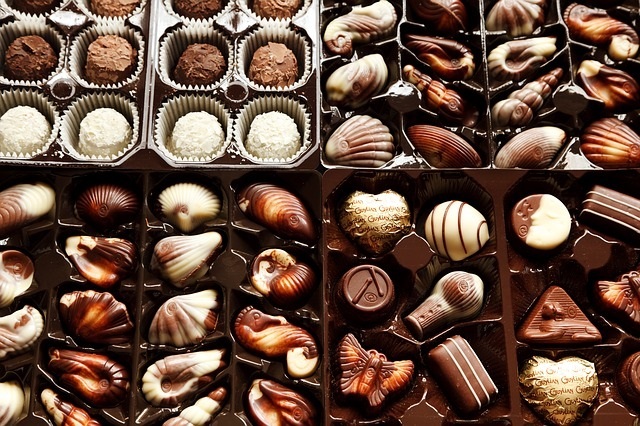 Not a cookie-cutter duplication or design. 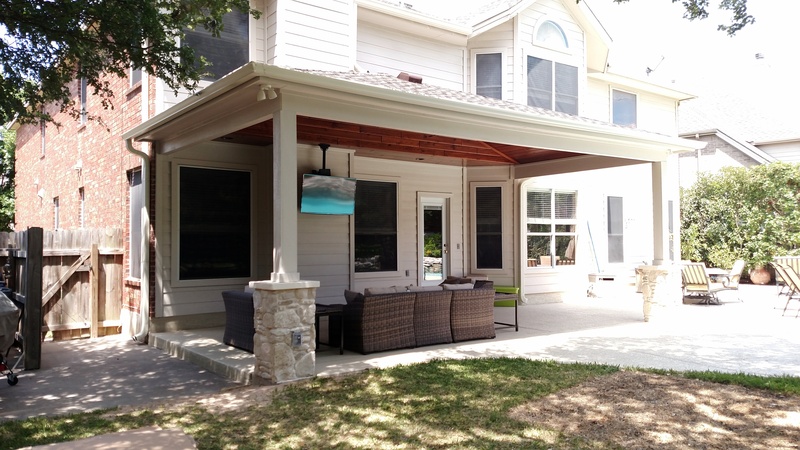 One of our most recent projects in Leander, TX, serves as the perfect example of an outdoor space that delivers based on functionality and keeping in scale with the architecture of the existing home rather than sheer size. 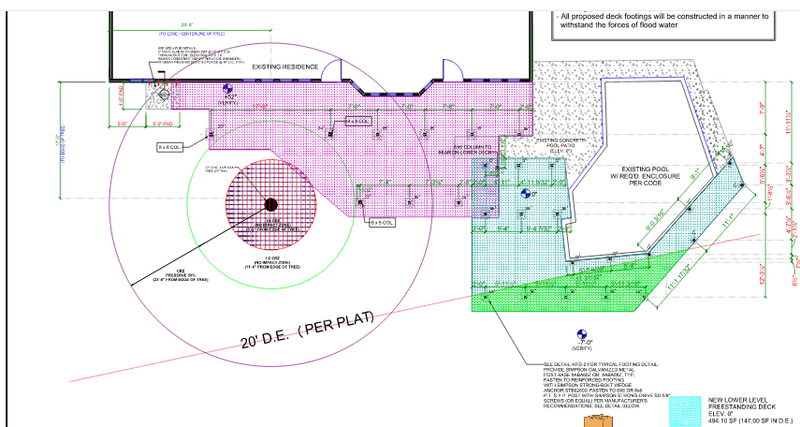 When we first met with the homeowners to discuss their anticipated design, their only outdoor living space consisted of a small concrete builder-grade concrete patio. 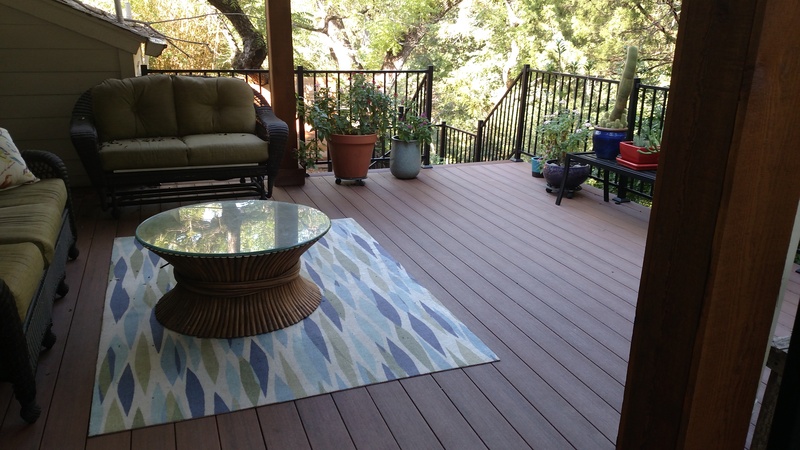 The homeowners wanted a space that was more conducive to the way they wanted to live outdoors. 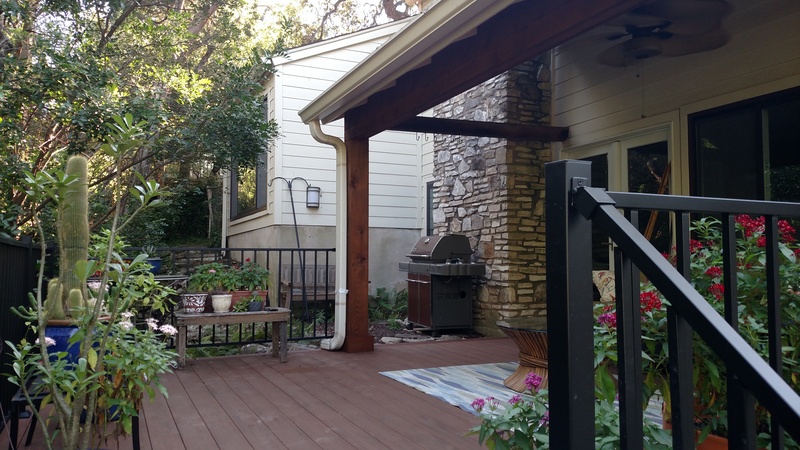 The patio has also been plumbed for the addition of a sink which influenced their desire to make sure their new space would include an outdoor sink. 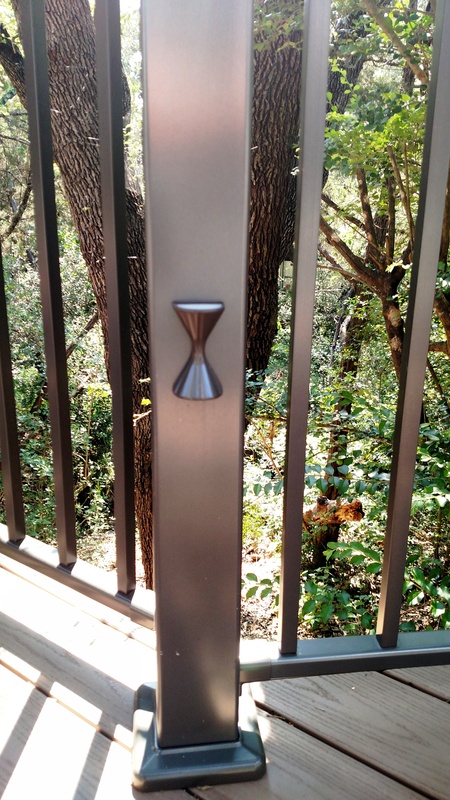 Our completed design enhances the entire aesthetic and function of the backyard of this home. 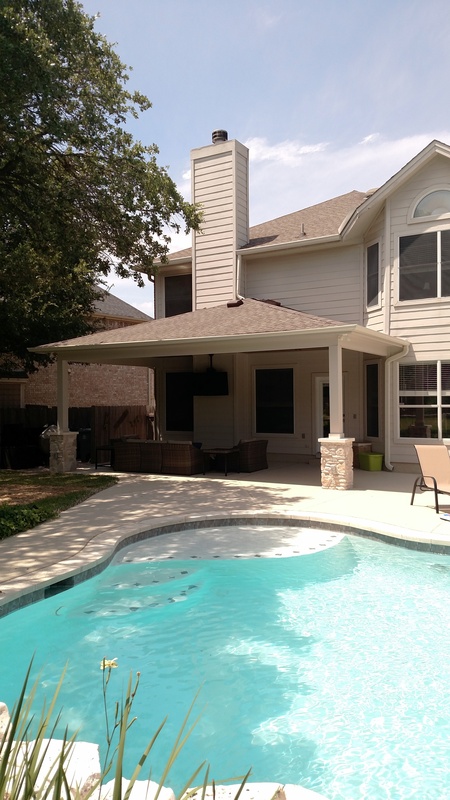 The new outdoor living space includes a gable roofed patio cover and freestanding pergola. 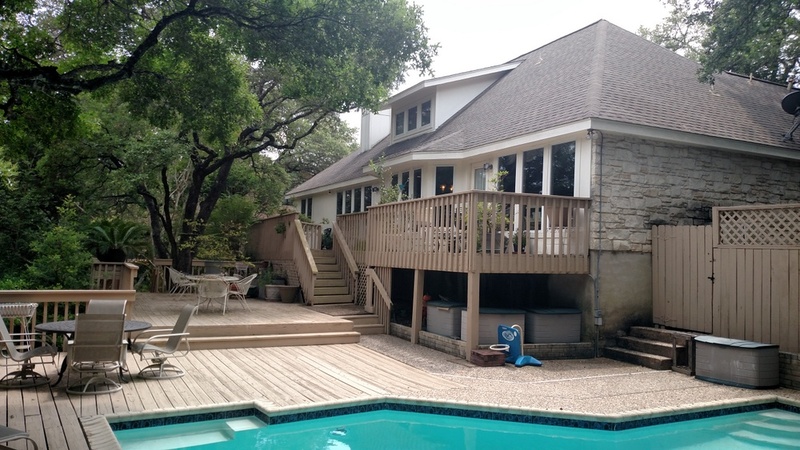 To accommodate the needs of the client, Archadeck of Austin extended the existing patio with a curved orientation and added brick columns to match the masonry of the existing home. 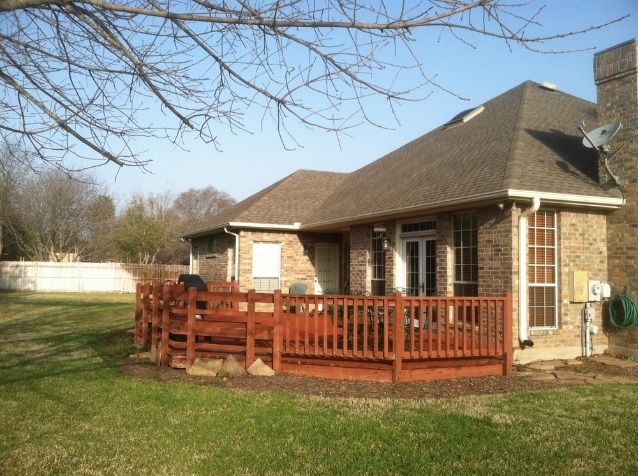 Cedar posts were used to support the roofed structures in unison with the brick columns. 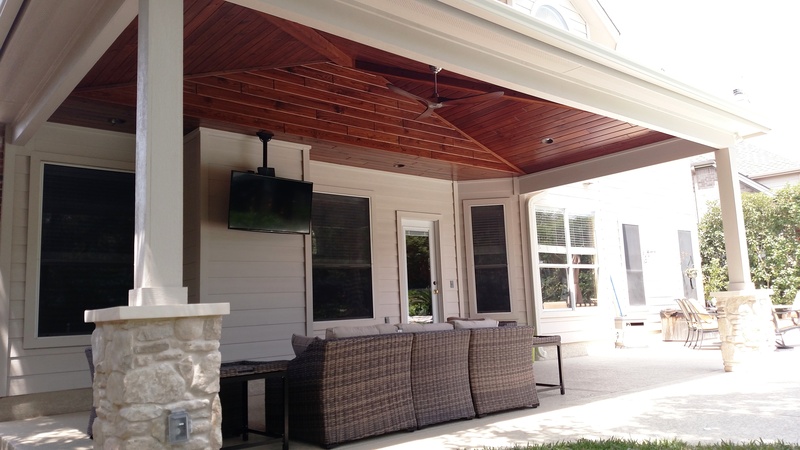 The pergola is supported by the roof extension of the covered patio portion of the design. 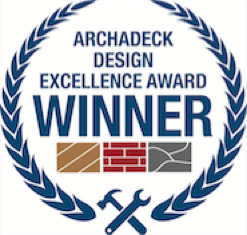 If you are ready to learn more about transforming your outdoor living space into the perfect backyard destination for you and your family, contact Archadeck of Austin to learn more at (515) 259-8282 or via email at jim.odom@archadeck.net.